I have studied the Tao de Ching, a sacred text written during the third century B.C. by Chinese philosopher, Lao-tzu. But I have never read, “The Tao of Pooh” by Pooh, himself. 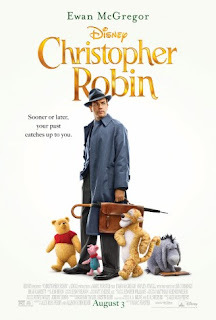 I suspect now it is a must read after watching the latest film that follows Winnie the Pooh and the rest of the gang in “Christopher Robin” where simple, yet profound, life philosophies are sprinkled throughout the movie. Then, life happens. Christopher (Ewan McGregor) grows up, gets married to Evelyn (Hayley Atwell) and has a child named Madeline (Bronte Carmichael). Although he loves his family very much, he is a dedicated employee, putting in long hours for a high-end luggage manufacturer in 1940s London. The economy, as a result of WWII, has declined and the wealthy have stopped traveling as much – and thus the luggage business declines. Christopher’s boss (Mark Gatiss) insists that they cut production costs or cut the staff. To save jobs, and – at the same time, provide the good life for Evelyn and Madeline, Christopher works day and night, giving to the company 100%. He's not only forgotten his animal pals of long ago, but it might seem he’s also dismissed his family in his attempt to do well. Until, that is, Pooh surprises him in a park near his home and the old adventures begin. This is truly a heartwarming, family-friendly story that is perfect for the young family who has read AA Milne’s Pooh stories at bedtime. There's a strong theme of being grateful for your life and for those you love. Compassion, teamwork, play, friendship and imagination also weave themselves throughout the film. But don’t let the sentimental family themes fool you. My husband, who is drawn to shoot ‘em up, high action, fantasy movies, found this film to be one of his new favorites. We both recommend Christopher Robin – whether you are a young family who loves the stories of Winnie the Pooh or you wish to enjoy a little philosophical whimsy, “Christopher Robin” is for you.